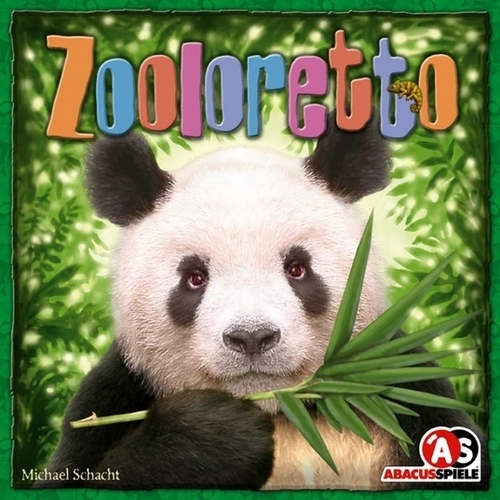 A few years ago, I was told by a couple of friends about this neat little zoo building game where players vie for odd-lot truckloads of critters for their zoos. Suffice to say, I was unimpressed by the sound of it. Then, I got a chance to play it. Holy God in Heaven; what a fun, nasty little game it turned out to be! While it has well-illustrated cute little pandas, leopards, and kangaroos, don't be fooled by the looks. This game is about stabbing your buddies in the back as best you can while trying to create your own personal menagerie of critters to take over the world. Well, the zoo world, anyhow. The concept of the game is that two to five competing corporate henchmen have opened zoos, and the object of the game is sort of a "The Price Is Right" version of zoology in that you're trying to fill all of your pens with precisely the right amount of varmints without going over. The turns are incredibly brisk, and the downtime is at a minimum the entire game. It's just a ton of fun, and while the strategic options are fairly limited as it's a mildly simple game, there's enough zebra meat on the bones to provide a very satisfying time to both younger players and total game geeks like myself. 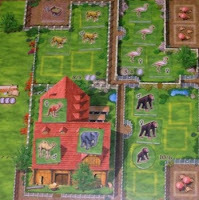 The box is quite nicely illustrated, as are the five player boards and zoo expansion boards that are included. The rules leave nothing to chance, are very well written, and come complete with illustrations to help with the finer points. Also included is a nice cloth bag, a bunch of wooden, silver coins, a big, red, wooden coin to mark the last round, and finally, there's five wooden slats and about a bazillion animal, animal baby, coin, and concession stand chits with which to populate your burgeoning zoo. I guess I should mention that there's also some multi-language reference cards, but after the first play you'll leave them in the box. All in all, the production values are perfect, and the only thing that really is missing is a Smallworld-style chit holder, which would've been a great addition. I bought a small Plano box to store everything separately, and it was well worth the four dollar investment, especially as it fits perfectly inside the box. 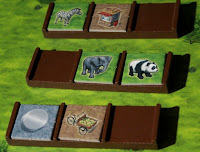 Setting up the game is a total breeze, and depending on the amount of players in the game, you may need to select a couple of animal types to keep out of the game. I recommend removing the chimps at every opportunity in smaller games, because it appears that even though the chimps have the same number of chits as the other animals, I always end up getting screwed by the monkeys; it's the board game equivalent of having a Costa Rican Capuchin toss feces at me. Don't know why it's always them that hoses me, but I'm telling you, don't trust the chimps. They're evil. If you have them in your zoo, chances are, in my own personal experience, that no good will come of it. And yes, I know that chimps are actually apes, not monkeys. I call them monkeys to denigrate them because I hate them in this game. Did I mention that? Anyhow, to describe this game, I'm going to assume five players because it plays best with five, although three and four player games are great, and the two-player variant is complete garbage. In a five-player game, all the species are used, so you simply toss them and all of the concession and coin chits into the cloth bag. Each player takes a game board and a wooden slat, which represent trucks. The boards are set in front of each player, and the trucks are set in the middle. Finally each player takes two wooden coins from the bank, and the game is almost ready to start. The last thing that needs to be done is that 15 random tiles are chosen from the bag and placed face down in a stack to the side, with the big red marker on top. These are the reserve for the last round, and I'll get into that in a minute. To play, the players take turns passing the bag like a offering plate at church, yanking out chits one at a time and placing them on one of the trucks. There's three spaces on each truck, and on your turn, instead of pulling a chit, you can take a truck with chits on it to end your play for the round, thereby claiming whatever was on the truck for your own evil corporate purposes. There's also coin actions allowed in lieu of pulling a chit, such as changing the layout of the animals on your board, buying a spare animal from an opponent, or sending an animal off to slaughter. Regarding that last bit, the rules simply note that you can "discard" a tile from your barn, but really, we all know it's not being released into the wild, so it's pretty clear that spending those coins buys you a leopard-skin rug or a set of nicely carved ivory tusks. Anyhow, there's four pens on your player board, and each one has a capacity between four and six. For three coins you can add on an expansion pen as well, in case you really want to go for the gusto and rack up points. The downside here is that unless you completely or nearly completely fill up an animal pen, you don't normally score points for the animals within. For instance, if you have 4 kangaroos in a pen that holds six, when the game ends you don't get squat. The caveat to that is if you have a concession stand sitting in the pen, it gives you two points for each unique concession type in your zoo, not to mention that they allow you to score a point for each animal inside the incomplete pen a concession stand is in. Some animals have little male or female symbols on them, and if you get a couple of them in the same pen, they make a baby animal, which you get for free and can place inside your pen. This can be good or bad, situationally, because if you place a fertile pair into a pen that becomes overfilled, the baby is separated from its family and sent to the barn. Luckily, though, every animal in the game is an exhibitionist and will only "do it like they do on the Discovery Channel" in pens, not in barns or on trucks, so you'll never end up with a barn full of babies you didn't want. Regarding scoring, you don't count up the points until the end of the game. Each pen has a set of point values associated with it, with the largest pens having the highest point values, and when you completely fill a pen, you're due for the higher of the two values listed. Some pens also have coins indicated, and when you fill the pen you immediately gain that many coins. If you come close to filling the pen but have one empty spot, you gain the lower of the values listed. Then there's the concession stands I talked about. In short, it's critical to maximize the space available, and rearranging your zoo several times in a game is not remotely uncommon. The barn is the Zooloretto version of the Island of Misfit Toys, where animals that can't be placed in a pen have to go to await their fate. Other players can buy them on their turn by paying a coin to you and one to the bank, and you can't deny them if they so choose to. 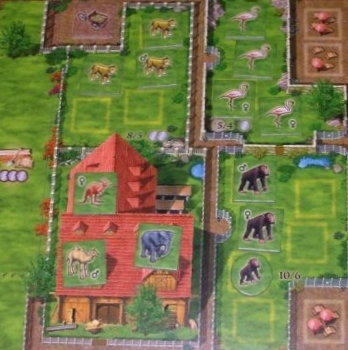 If you expand your zoo or rearrange it so that you can fit an animal in one of your pens after all, you can pay a coin on your turn and move a single animal per turn to a pen. Because animals in the barn give you negative points at the end of the game, there's a huge impetus to turn pandas into lovely tapestries or have your zoo's shop loaded with stuffed animals, and I don't mean plush toys. Concession stands that are unplayable also go to the barn presumably to prepare the lovely kangaroo-on-a-stick and camel jerky for the next day's sales. Animals and concession stands in the barn don't cost you points per chit in the barn, though, they charge you by the type. If you have an entire herd of elephants, for instance, it doesn't cost you any more points than if you simply had one elephant. You can use this to your advantage because there's a finite amount of critter chits in the game, so if someone has only a few of a varmint type that you have in the barn, the person may end up lining your pockets through the illicit purchase of said critters. You can control quantities in this regard, and really hose people out of eight or ten points by hoarding a type of animal that's in several zoos, and it only costs you two points, so it's a big net gain. Plus, you can always send them off for the low price of two coins, which I'm assuming is the bribe used to have the officials look the other way while your staff is serving up elephant steaks at your concession stands. When the last chit is pulled from the bag, the game's last turn begins. Those chits you set aside under that big red marker now get tossed into the bag and when all of the trucks have been taken for the round, the game immediately ends. Tally up the points, and the person with the highest score gets to do a victory lap around the room. In case of a tie, the person with the most cash left in hand wins. In conclusion, this is a really, really fun game. It's much more fun when you're playing with people that aren't AP-prone, and even more so when you're playing with sadistic individuals such as myself that wonder aloud if the Flamingo meat you just carved up for two coins tastes anything like bald eagle or spotted owl. The game can be very, very backstabbity with experienced players, and while the cute, lovable little animals and animal babies can lull you into thinking it's primarily a game for kids, it's definitely a sinister game of corporate greed, illegal slaughter, and illicit ivory trade. There are a MESS of expansions for this game as well, extending the life of an already infinitely replayable game and adding some truly epic, game changing stuff such as a petting zoo, larger concessions, and small aquarium attractions among others. A couple of the expansions are even downloadable, for free, from Rio Grande Games' site, and I'm telling you that if you don't like this game, you may be a fun-bludgeoning snapperhead. I truly adore this game, and I cannot envision myself ever trading it because it always gets played, a good year and a half after I got it. If I had to pick on just one thing, there's not much in the way of direct player interaction beyond maliciously placing chits on trucks you know someone wants, thus sticking an opponent with a critter they can't use or dissuading them from taking the truck. As someone who likes to whine about stuff, it's a pretty short list. - There's not much direct player interaction, instead it's more "messing with the resource pool"
If you have kids, buy this game. If you don't have kids, buy this game. Just buy this game. The only people I wouldn't recommend this game to would be someone who doesn't like Euro-style optimization games or that don't have a lot of direct player interaction. I bought this on Ebay for full boat, and I absolutely have gotten my money's worth.